Starting from a solid piece of aircraft-grade aluminum and finished with the highest quality AR-coated (HD) glass and surgically-precise turret systems, EOTech Vudu riflescopes can compete with the world’s best. Those with experience in the military and tactical shooting are more likely to have experience with products made by Ann Arbor, Michigan-based EOTech than hunters and other shooters. Sportsmen who shop for optics at the “usual places” might not know much, if anything, about them. But they should. Electro-Optics Technology (abbreviated EOTech) was founded in 1995. Until that time, the company was part of the Environmental Research Institute of Michigan (ERIM), a non-profit research and development outfit formed in 1972. ERIM itself has its roots in post-WWII and Cold War era United States, where it worked under the name Willow Run Laboratories as part of the University of Michigan from 1946 until ERIM split in 1972. For a long time ERIM was heavily involved with the development of remote sensing and surveillance equipment, which was meant primarily for military use. For this reason, much of ERIM’s early work is still classified and inaccessible to the general public. In 1993, ERIM decided to commercialize its technology, creating the Michigan Development Corporations (MDC), as well as several for-profit subsidiaries. EOTech was officially founded by MDC as an ERIM subsidiary. There's more. A dozen years later, EOTech was acquired by L-3 Communications — one of the world’s leading defense contractors — and effectively became an optics division. Finally, in 2010, L-3 acquired Insight Technology and the two companies have been partnered together in the same division ever since. Insight produces aiming solutions, illumination sources, thermal imaging tools, and night-vision image intensifiers. L-3 specializes in intelligence, surveillance, and reconnaissance; secure communications; government services; training and simulation; and aircraft modernization and maintenance. EOTech designs, manufactures, markets and distributes electro-optic products. In 1996 the company displayed its holographic weapon sight (HWS) at the 1996 SHOT Show, hoping to penetrate the hunting and competition shooting markets. Four years later, EOTech introduced a second generation of HWS. The following year, EOTech unveiled a new line of holographic sights geared specifically towards military and law-enforcement applications. Over the years, EOTech has manufactured tools used by U.S. Special Forces, as well as the Marine Corps. Today the company’s products encompass holographic weapon sights, riflescopes, lights and lasers, thermal vision devices and night vision devices. In 2016, EOTech introduced its line of Vudu Precision riflescopes. These are no-nonsense, serious optics for serious shooters from hunters and law enforcement officers to government agents. Starting from a solid piece of aircraft-grade aluminum and finished with the highest quality AR-coated (HD) glass and surgically-precise turret systems, the Vudu line of riflescopes is designed to compete with the world’s best. The line includes 1-6x24 Precision and 2.5-10x44 Precision with 30mm tubes; 3.5-18x50 Precision and 5-25x50 FFP, both with 34mm tubes; and 8-32x50 SFP and 3.5-18x50 SFP, with 34mm tubes. 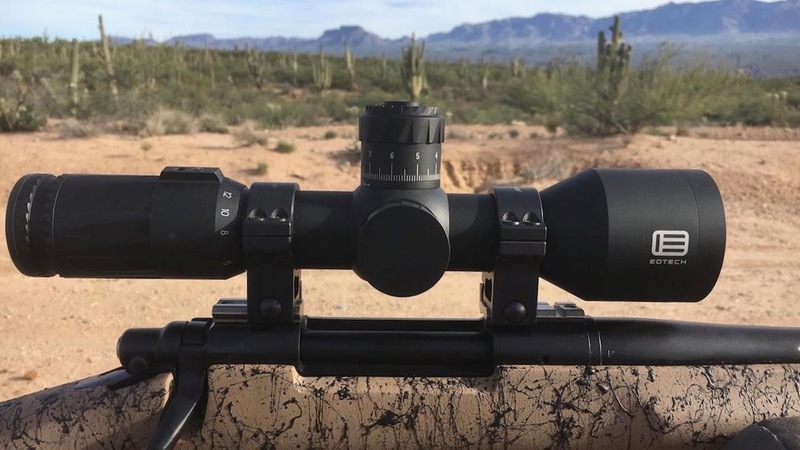 All Vudu scopes save the SFP models have a first focal plane sight design, which facilitates quick and accurate ranging using the reticle, something that remains true regardless of the level of magnification. The SFP models offer second focal plane design. All Vudu scopes have the ability to illuminate the reticle. I’ve used both the 3.5-18x50 and, just recently, the 5-25x50, models a fair amount, both on the range and in the field. The 5-25x50 model, introduced in the summer of 2018, is actually designed for short platform (AR-style) rifles. Still, I mounted mine on a Remington Gen 2 bolt action rifle for a November elk and mule deer hunt in Montana. 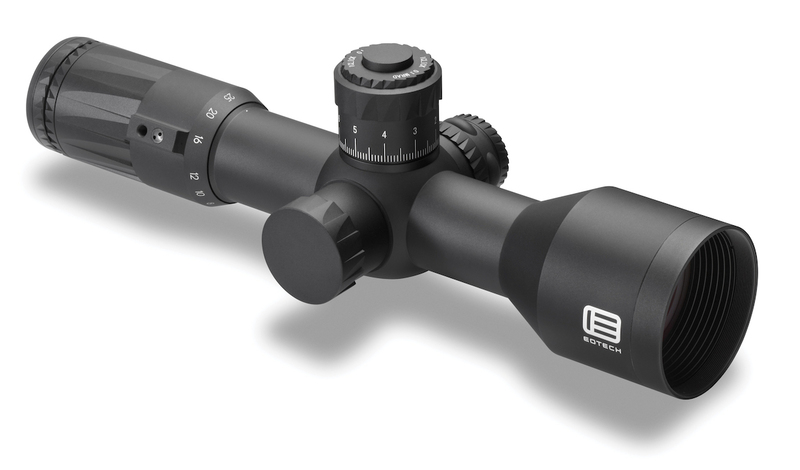 At approximately 11.2 inches in length, this scope is one of the shortest first focal plane rifle scopes on the market. The elevation turret includes a push/pull locking system and EOTECH’s EZ Chek Zero Stop, which allows for quick adjustments and return to zero. One unique advantage of the short design is that it provides the ability to attach either a clip-on night-vision or thermal device in front of the scope. Yet, this still allows the user to make adjustments to the device without leaving the scope. There are several things that have impressed me with Vudu scopes. First and foremost, these things are built like an Abrams tank, tougher than nails and can take a lot of field abuse and still perform. Secondly, the optical quality, to my eyes, is as good as it gets. The glass is crystal clear and you can see the target well even in the dimmest shooting light. And third, the turrets are beefy and easy to use, and the adjustments extremely precise. Are they cheap? Absolutely not. MSRP’s start at $1,399 for the 1-6x24 model and run all the way up to $2,099 for the 5-25x50 model. 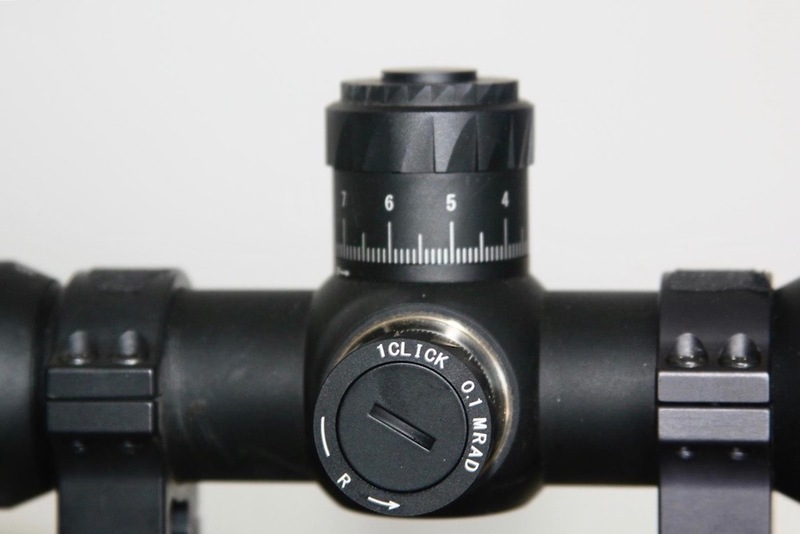 That’s in line with the best scopes from other premium optics manufacturers. I would not be afraid to put a Vudu scope on my best hunting rifle and take it anywhere on earth, where shots could either be in-your-face close or as far as you and your rifle are capable of shooting. Looking for the best? Check out EOTech Vudu scopes here.